The Accélérateur Banque Nationale – HEC Montréal program has just announced the companies in its 2015 cohort that have each won one of its awards, totalling more than $30,000. 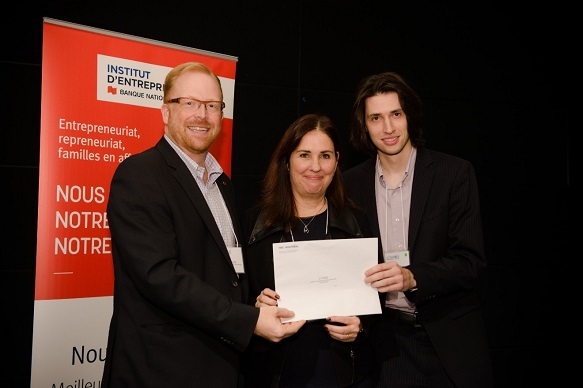 Among the eight finalists, ÉAU Montréal definitely took the most honours: first place in the competition and the best-attendance award, totalling $13,000, along with the Univalor Innovation award, consisting of a bank of coaching hours. OVA took second place and a $7,500 prize, while Fleexer came in 3rd and won $5,000. The Jury’s Choice award, worth $5,000, went to Orisha Infusions. As part of this 12-week accelerator program, the selected companies were given access to extensive resources and attended workshops on different aspects of starting up and growing a business. All in all, over 40 professors, entrepreneurs and experts assisted the selected companies in design thinking, corporate strategy, business networking, marketing and communication, e-commerce, financing and financial modelling. The program is offered for all teams that include at least one student or graduate from the Université de Montréal, HEC Montréal or Polytechnique Montréal. The next recruitment period will be in August 2016. The jury was made up of Marc Alloul (repeat entrepreneur and co-founder of Budgeto), Manaf Bouchentouf (Director, Accélérateur Banque Nationale – HEC Montréal), Luis Cisneros (Associate Professor, HEC Montréal, and Director, Institute for Entrepreneurship National Bank | HEC Montréal), Nicolas du Parc (Project Director, Univalor), Milad Haddad (Commercial Sales and Service Manager, National Bank), Stephane Leblanc (Tax Partner, Ernst & Young), Jean-Philippe L’Écuyer (Entrepreneur in residence, Futurpreneur Canada), Nathalie Marcoux (Vice-President, Finance, Capinabel) and Caroline Pelletier (Director of Development, Anges Québec). 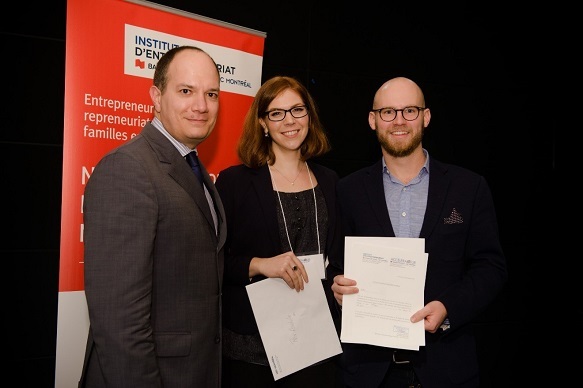 Luis Cisneros, Associate Professor, HEC Montréal, and Director, Institute for Entrepreneurship National Bank | HEC Montréal), with the winners of the 1st prize and attendance and innovation awards, Émilie Nollet and Olivier Demers-Dubé, for ÉAU Montréal. Éric Laflamme, Account Manager, Commercial Banking, Technology Group, National Bank, with the 2nd-prize winners, Lucie Rivard and Harold Dumur, for OVA. 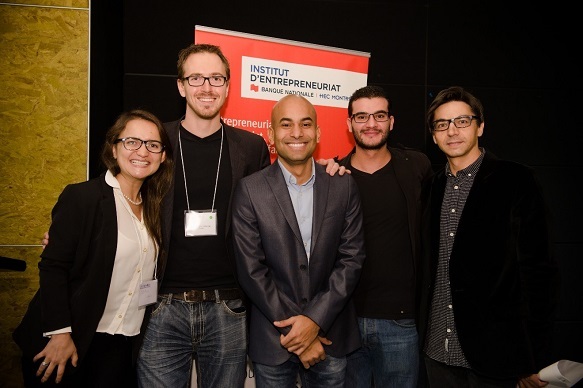 From Fleexer, 3rd-prize winner, Diana Niño (Web), Alexandre Laberge and Samuel Therrien (co-founders), Adel Bel Abbas (finance), and Franck Barès, Director of the Department of Entrepreneurship and Innovation, HEC Montréal. 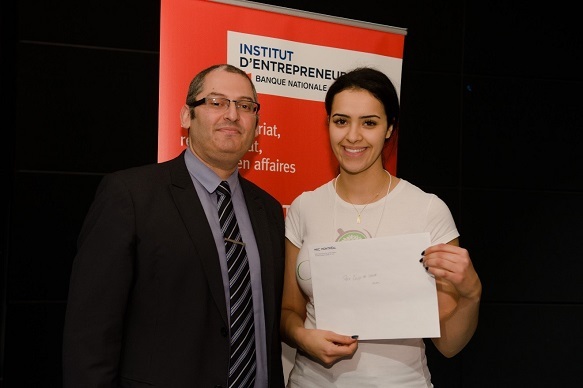 The winner of the Jury’s Choice award, Sarah Seddiki, for Orisha Infusions, with Manaf Bouchentouf, Director, Accélérateur Banque Nationale – HEC Montréal.